Charles Street is the local shopping district for the wealthy Beacon Hill neighborhood. Charles Street is located at the base of Beacon Hill, on its western slope. It begins at Charles Circle, near Massachusetts General Hospital, and ends between Boston Common and the Public Garden. The Charles Street area is distinguished by its architecture, and by the mixed use of its buildings. There are businesses on the street level floors of low-rise brick townhouses, with residences on the upper floors. The character of Charles Street is similar to parts of London or Amsterdam, which is a rarity in younger American cities as compared to Europe. The businesses on Charles Street cater to the local community. The buildings on Beacon Hill are highly dense, with many narrow streets of one-direction. Many residents do not even own a car, as they can walk to work in the downtown area. Thus, Charles Street contains businesses varying from laundromats to convenience stores. But there are also antique stores, gift shops, art boutiques, and specialty clothing stores. Charles Street even has a shop with mostly antique hardware; for replacing those 150 year-old door knobs or cabinet handles in the historic buildings on the Hill. In general, the Brahmins have long departed Beacon Hill for Boston's North Shore, and the current residents are predominantly urban professionals. In some of the shops on Charles Street, the staff can be somewhat pretentious. A few stores post hours of operation, but the owners do not even show up on time or open for the day. 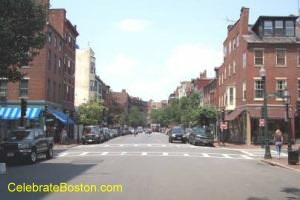 In this author's experience, the older the money, the less pretentious, and Charles Street has changed over the years, as have the other neighborhoods in the city. Nearby attractions to the Charles Street shopping area include Cheers Boston, Public Garden, Swan Boats, the State House, and Boston Common. Walking Directions: Exit the station, Charles Street begins on the west side of Charles Circle at the base of the station.